Bold and beautiful, that was my mood while making this unapologetically siren-red, full-bodied risotto. You know how on some days you’re happy with your workout, the endorphins kick in and you feel like a million bucks. So I was ready to pull out the stops and dish out a dinner that had a Beyonce-like personality – eyeball-attracting appearance and robust,voluptuous flavours. The time was right for me to pull out the spicy, red chorizo I had been saving for precisely such an evening. To further up the colour quotient, I had some bright yellow and red sweet salad peppers that would make the perfect complement to the spicy-sour sausage. I simply removed their stalks and seeds, sliced them into rounds, doused them with olive oil and roasted till lightly charred and juicy. And yes, to anoint the meat and the vegetables in a red cloud of smokiness, I used paprika (fairly generously I might add), one of my favourite spices. 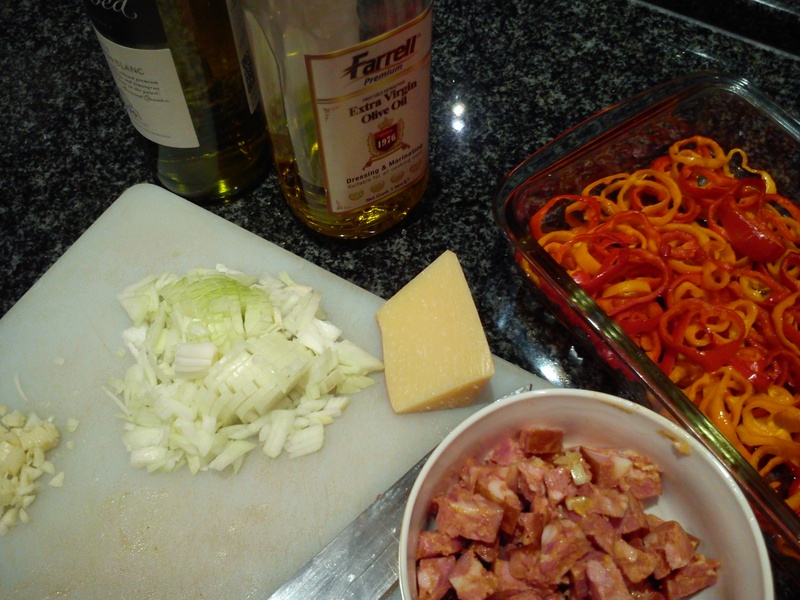 The other ingredients were standard order for a risotto – garlic, onions, Arborio rice, white wine, chicken stock and parmesan. With a glass of red for company, it was a near-perfect Friday evening cooking this kicker of a dish. The boys ate every last grain; something that gladdens my heart more than compliments. 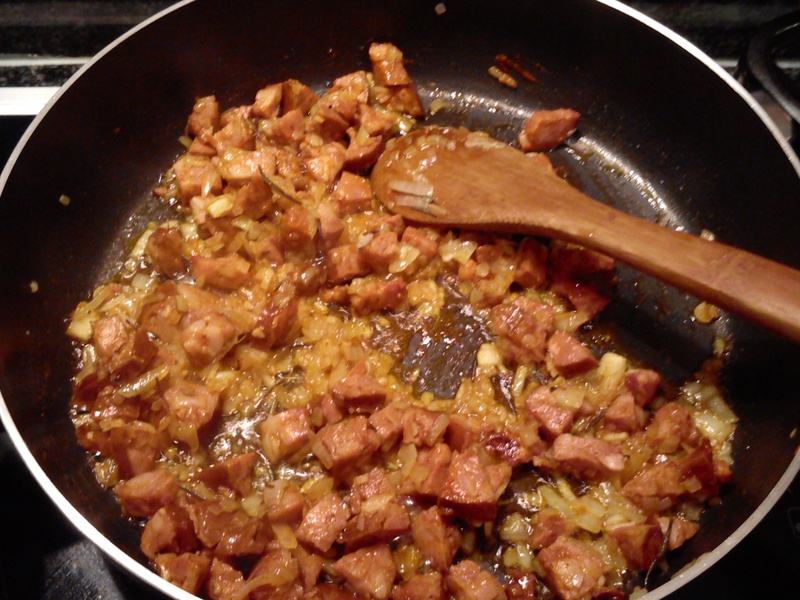 My friends in India can use Goa sausage in place of chorizo since it is a very close cousin (a cherished heirloom of Goa’s Portuguese past), and is just a tad more vinegary. Drizzle sliced peppers with olive oil and roast in the oven at 180 degrees C for 20-30 minutes till slightly browned. Remove the skin, chop roughly and set aside. Heat olive oil in a pan and throw in chorizo, onion and garlic and sauté on medium heat for 3-4 minutes to allow the sausage to render its spicy, red oils. Add the rosemary, paprika and the rice and sauté for a further 3 minutes. Pour in the wine and allow to bubble so that the alcohol evaporates. Now season with salt, pour enough chicken stock to just cover the rice and cook on low to medium heat, adding little stock as needed to cover the rice till the rice is cooked to a creamy consistency. Stir the rice with every addition of stock. When the rice is almost done, mix in the peppers so that they integrate with the dish. Check seasoning, add the butter and switch off the heat. Let the risotto sit for a couple of minutes and serve.